There is a ready collector market for vintage trapping supply house catalogs, posters, and the classic trapping method books. E.J. Dailey’s method book Traplines and Trails, published by HUNTER-TRADER-TRAPPER magazine in 1925, contained 242 pages of trapping information. By the sixth edition, all hardback, it had been trimmed to 184 pages and was being published by The Outdoorsman of Columbus, Ohio, yet still listing the 1925 copyright date. The 179-page revised seventh edition, lists Outdoorsman Publishing Co., Inc, Chicago, as the publisher with a 1945 copyright. Eric Jack “E.J.” Dailey, born September 27, 1889, was arguably the best-known trapping writer of the first half of the 20th century, serving first as trapline editor for H-T-T and then FUR-FISH-GAME. His stories can be found in later issues of H-T-T, in almost every issue of F-F-G, in Fur News & Outdoor World and ’most every other trapping publication. Dailey also ran his own trapline supply business. He mailed his first Animal Lure brochure in 1930 and his first catalog in 1936. The last catalog mailed from his Ogdensburg, New York, home—before the 1972 season—includes a photo of E.J. taken in 1917 at his Cold River, Adirondack Mountain camp. Dailey passed away March 28, 1973. Rob Erickson of Glendale Heights, Illinois, purchased the E.J. Dailey line of lures in 1996, and they still sell well today. In 1938, O.L. Butcher of Shushan, New York, produced Trapline and the Trail, a 36-page booklet filled with trap sets and information on trapping. It was only produced in paperback, with the second edition listed as U.S. Government Pat. Office Class AA No. 260913. The booklet was produced in two sizes and I am not sure how many editions. Butcher’s second trapping method book, titled Trappers Guide, was very similar to Trapline and the Trail. It was first advertised in O.L.’s own 1946-47 trapping supply catalog. Same as Daily, Butcher had a line of lures and ran a supply business. The first O.L. Butcher trapping supplies catalog appeared for the 1938-39 season. The last is the Inventory Sell Out catalog of 1986. Butcher also produced several other small booklets: Wolf and Coyote Trapping, Professional Fox Trapping, Professional Cat Trapping, The Professional Beaver and Otter Trapper, and The Mink and How to Trap Them. Okey “O.L” Butcher was born in Braxton County, West Virginia, in 1901 and passed away December 15, 1967. S. Stanley Hawbaker of Greencastle, Pennsylvania, published Trapping and Trailing in 1938. This 58-page softbound booklet was loaded with sets and trapping information. It is very rare today and quite collectible, as only 500 copies were produced and far fewer have survived. 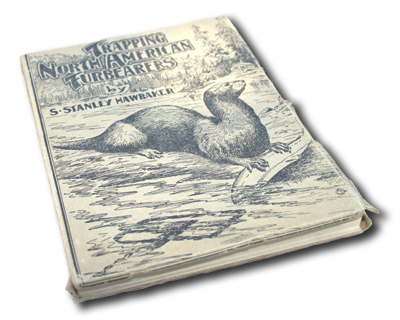 When Hawbaker sold out of Trapping and Trailing in 1941, he replaced it with Trapping North American Furbearers, the first edition being a paperback with an oversized cover. This trapping classic was a best-seller for many years and to this day continues to provide good information in a lively manner appreciated by novice as well as seasoned trappers. More than 18 editions, including several major revisions, have been published. Clothbound as well as hardbound editions continue today. The first Hawbaker’s General Trapping Supply Catalog appeared in 1940, and by 1945, the business had grown to the point Hawbaker needed a bigger facility and relocated to Fort Loudon, Pennsylvania, where the family business continues to this day. October 27, 1983, when Stanley was 72 years old, he passed away following a timber cutting accident. Like Dailey and Butcher, Hawbaker also published several small booklets focused on trapping individual species of furbearer. The Hawbaker supply catalog is still being published by Stanley’s son Edwin Hawbaker, who also bottles the lures and runs the supply business. A copy of Dailey’s Traplines and Trails in good shape can usually be found for around $25. Butcher’s Trapline and the Trail goes for $10 to $20. The rare Hawbaker Trapping and Trailing commands a couple of hundred dollars on the collector market—if you can find a copy for sale.